August 28 marks the first anniversary of the death of Juan Gabriel, one of the most beloved and popular Mexican singer-songwriters of the Spanish-speaking world. He will be remembered for the countless songs in various musical genres that have become iconic standards, for the rags to riches journey of his life story and for the energetic performances that endeared him to audiences across the globe, particularly in Latin America. But for many LGBTQ Latinos, Juan Gabriel’s flashy personality on the stage offered a level of visibility to feminine mannerisms that were, for the most part, shunned by a culture of strict gender roles and machismo. Juan Gabriel transcended the fear of ridicule and exposure and somehow, he was and is still cherished. Juan Gabriel — or Juanga — never officially came out as a gay man. It was one of the longest open secrets in the entertainment industry — a don’t-ask-don’t-tell agreement in which his millions of fans were complicit. As a young performer, he evaded any insinuations about his sexual identity. But as he got older, he became coy with his response. “Lo que se ve no se pregunta,” he’d say to uncouth interviewers — what one sees doesn't have to be questioned. Over the years, Juan Gabriel weathered a number of public scandals created by former employees or alleged lovers who were intent on outing him. But these efforts were short-lived, dismissed by his adoring fans as extortion efforts by opportunists. Juan Gabriel’s reputation was solid and unshakable. By the time of his death at the age of 66, he had become comfortable in the image he had cultivated; he called out to his audience: “¿Quién se quiere casar conmigo?” Who wants to marry me? And both female and male voices from the crowd would yell out, “Yo!” It seemed that the times had caught up to his sexuality. 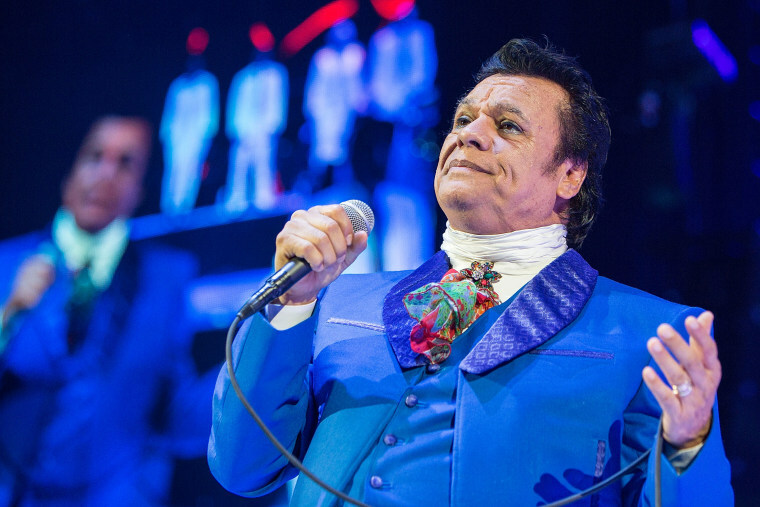 In the queer Latino community, there were differences of opinion about Juan Gabriel’s silence. Many pointed to Ricky Martin as a better example. When he came out in 2010, his career didn’t appear to suffer, and suddenly the word “gay,” which had rarely been uttered on Spanish radio or television, became audible and applauded by LGBT groups as a step forward in removing the stigma of gay identity, which was still palpable in the Latino and Latin American communities. Others accepted Juan Gabriel’s decision to keep his sexual identity unnamed as part of his personal journey, one that many were all too familiar with — to remain in the closet also had its complicated reasons. When I discuss Juanga’s sexuality with non-LGBTQ fans, I usually get some pushback: What does it matter? My immediate answer is that it matters to me. As a boy growing up in the 1970s, uncertain about my own sexuality, movies and television were unequivocal in their negative portrayals of queer desire and identity. Gay men were outcasts, clowns and predators. They were the punch lines of jokes. Their emotions were two-dimensional, almost non-human, and non-humans were easier to persecute. I needed to see a role model for a way to exist in the world that was not fraught with danger, isolation, or heartbreak. I needed Juan Gabriel, who expressed merriment and delight. Juan Gabriel broke barriers being himself. The joy that one felt when he began to record is incredible It was a new style that quickly developed as part of the music of Mexican Americans, who were winning the fight for their civil rights, so it was our music. For Chicanos, the art of creating with what you have, no matter how poor it is, and making it beautiful is rasquachi. It's an underdog perspective. This is what Juanga does in his music with incredible grace. Juan Gabriel was the kind of gay my mother could love and one I was not: a twirling sequined sensation who adored mothers and sang to them about their dead children. To her, he was that someone who told his lover to go to hell and al fin que ni te quería anyway, (in the end he didn't love you anyway), all of which were songs she could not sing herself. When our artistic idols die, they leave us the lasting beauty of their work, which will continue to entertain and inspire. Juan Gabriel will certainly be one of those timeless talents, whose lyrics and music appealed to a range of identities. But for many of us who identify as immigrant and/or queer, he was also an important connection to a homeland, a language, and a cultural landscape that we reached for during our loneliest and most vulnerable moments, but also during moments of triumph and joy. Gracias, Juanga.